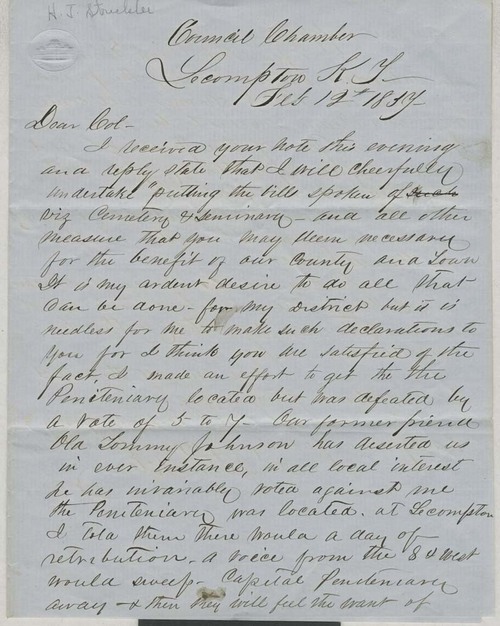 Hiram Jackson Strickler, writing from Lecompton, Kansas Territory to Thomas N. Stinson of Tecumseh, Kansas Territory, described his attempts as a Territorial Council member to advocate on behalf of Tecumseh. He commented upon an unsuccessful effort to have the penitentiary located at Tecumseh. He also mentioned his opposition to issuing bank charters due to his concerns that the banks would issue "wild cat shin plasters" (devalued paper money).